Passport is a legal document used for travel purposes. The document is significant as it helps one land abroad and fulfil they travel needs like education, business or just vacation. The document is officially under the ministry of external affairs. The Indian government has improved the passport issuing process by opening passport offices namely passport seva offices. The offices assist citizens in accessing passport first and in a convenient way. Here one can apply, renewal and enquire any detail containing passport. The passport seva Kendra offices link up with the police stations and post offices where the passport will be sent after all verifications are done by the police. Passport application process has been simplified, with the recent technology one can visit the seva Kendra offices or even use online methods to acquire the documents. With the introduction of seva centers the government allowed individuals to apply for passport anywhere in the country. in India we have biggest office in consular, passport and visa division, Patiala House in New Delhi. This are the highest offices however, you can check for local and residential offices near you. The link above will guide on where passport offices are located. Applicants can follow the below online application process. Existing applicants should login with their user ID and password. A new page will open and the applicant should fill in all their details from name, address, phone number etc. The first page applicant enters information of whether they are applying in passport office or the CPV Delhi. Here the passport is either diplomatic or official passport. Whichever the case the applicant can also visit the seva Kendra offices. Enter name 35 characters only, go to the login ID use your email address. Followed by a strong but simple to remember password, reconfirm the password. Pick on a hint question and answer which will help you when you forget login information. Fill in captcha code after rechecking click register. After this process the system will take to application page. Fill in all the details from the application form then submit. Go to the payment and schedule appointment, which is a link on the same page. Check on the saved/submitted application and create an appointment. Payments method are done by either online payment of offline. Though the online payment has been legalized and made compulsory in order to book for an appointment. Use the credit/debit cards, internet banking or the SBI bank challan. Select the “print application receipt” on the page. The receipt should contain a reference number ARN which is an appointment number. You can carry the receipt or show the SMS confirming your appointment date at the passport office. Carry all the original documents on the appointment day. EPFO is one of the major organizations in India that is providing various services to its employees. It has now emerging with its varying services through online also where you can have access to various kinds of services that it is providing at your own mobile smart phone. The employees from various organizations get the advantage of working full time as they get PF amount after their retirement. An portion of amount from their salary to transferred to PF account every month and that be stored safely, such same will also be contributed by the employer for the wellness of the employee. The employees of these organizations will leave the organization with PF amount which makes them confident for their further livelihood. It brings financial stability to the retired employees. Most of the employees save the PF money for their girl child marriage or sons education, and moreover the interest will be credited to the employees PF amount during the period of saving, which the PF amount huge while withdrawing at the time of retirement. You can login to the EPFO UAN and take any type of the services provided by the website like viewing your balance, getting your loan status if you have applied. User id and password are different and are unique to each person. The password should be made confidential so that any other will not take the advantage of your account. 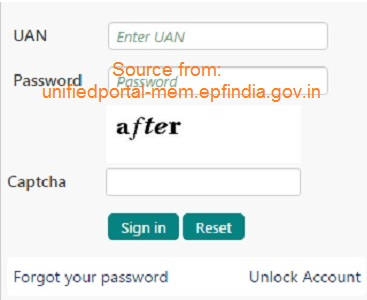 If you have lost or change or need to Reset UAN password and UAN Activation then you can follow the below steps for simple change of your UAN login password. Click on the forgot password at the login section which you will find in the page. And then click on forgot UAN Login password where you will be redirected to a new page. In the new page enter the CAPTCHA provided properly and then enter your UAN number and then click on submit option. Then opens a new window where you need to enter your UAN number and your registered phone number and click yes. Then you will get an OTP to the registered phone number and then enter the OTP in the space provided and click verify option. Once your OTP has been verified then you will be able to create your new password. Enter your UAN Login password and then in the confirm UAN password, re-enter your new password. This is the last step and once password was set you can login to your account through your new UAN Login password and have access to all the services provided. Hope the article is useful and has provided you the information that you were searching for. You can have all the latest information on EPFO in our website. What is Adangal? This known to be a type of land record that is usually conserved by the village Administrate Officer. Adangal is also known as the village account number 2. This account is written or renewed annually by the village Administrate Officer. The Adangal record is the excerpt from a register, which is maintained at the VAO office. This contains specific information that Patta/Chitta extracts which includes: Taluk, District, village, patta number survey, number with the sub division details and the land owners name with the father’s name. As same as AP Meebhoomi website the West Bengal State also launched a ultimate web portal on West Bengal Land Reforms to Check Banglarbhumi Khatian & Plot Information in banglarbhumi.gov.in website. To enable you have and enjoy the opportunity of checking Adangal land details, you must begin with downloading the app online to enable you access the beautiful and easiest information online. The government of Pradesh has launched or permitted Mee bhoomi website to access details of their agricultural lands like Adangal pahani online. Step1: you will be required to login to meebhoomi.gov.in website. On logging in, you will have a popup blocker on your screen which you will be required to click on the given options to allow the site open. Step2: click the measurement book and at this point you will be required to select the district, Mandal and village. Then you enter the code. Following the same procedure, you can download the information about the Adangal, the gram Adangal, 1B,Gram,Gram patam,1B, pahani land owner, area, assessment,water rate,soil type, tenancy, liabilities, crops grown, and the nature of the possession of land. The mistakes in the land registration information and the land owners are rectified in the meebhoomi website or the Android app. The government launched the Android app. All this is being done to achieve and maintain transparency and make sure there is easy verification during the registration or when people are applying for the loans. Then choose the name of your district and the village name. Enter the number that you already selected. Enter the image number then click the button. When do I get the money and do I have to save? The common question especially for new employees. The money covers you in retirement it will benefit you and family at the retirement age. You have beneficiary as on one of the family members. The fund is compulsory for all government employees. On historical basis the scheme was launched by the India government in the year 1952. This through the employee provident fund and miscellaneous provision act. The Jammu and the Kashmir state among all the India state exclude themselves from the scheme. It is the biggest social scheme in the world and almost all the people in organization and government are registered in the EPF scheme. If a certain situation pushes the user on can have a temporary withdraw. But has to be paid so after or maybe the first month after the loan. As the system developed the employees can move from one job to another and still get their PF fund. Before it took long to transfer the funds to new employer. 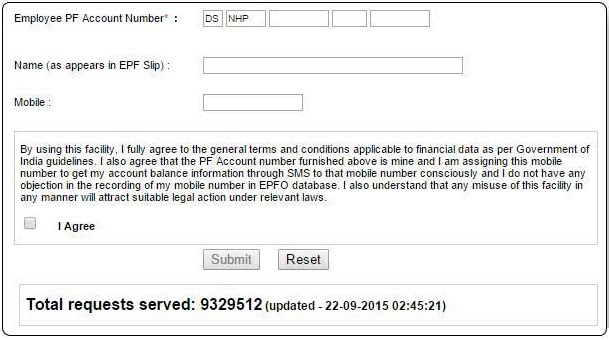 How do I check my EPF balance without UAN Number or PF number? First ensure the UAN number is activated by your current employer. Go to the “our services” on the menu bar. Select the “option member passbook” on the same menu bar. The login page will appear on the screen, now enter your UAN number and the password. Now you have the access for all other government services. The following are the detailed steps to know the Employee PF Balance Check without UAN / PF Number in passbook.epfindia.gov.in. Instructions are as follows…. Send an SMS to the number 7738299899 on the same box type EPFPHO UAN ENG. The ENG abbreviation only show the type of language to use. You have many option like: Kannada, Malayalam, Gujarati, Hindi, Bengali and many others. Example SMS EPFPHO UAN MAL. Give a missed call on 011-229014016 from the registered mobile number. The menu will open up and click on the option of “your PF balance. A new page will open and on the heading a member balance information will show. Click on the option of your state. Now enter your PF number your name, mobile. Select a box written I agree. How do I check the EPF status at the passbook? Go to menu bar and select “our service” on the same menu select “for employee’s and click service. Select know your claim status. Two boxes will open, enter the UAN number and the other box enter you captcha code.